A Virtual Landslide. 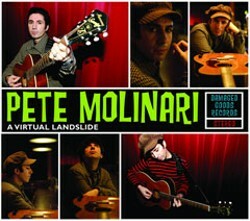 Peter Molinari (Damaged Goods). This UK singer/songwriter's sophomore effort is lush, though not overblown, creating a full sound that perfectly compliments his folk, country and pop sensibilities. Analog-recorded by Liam Watson, and accompanied by Toe-Rag Studio musicians, Molinari's uncanny and sincere delivery is brilliantly captured. This is one of this year's recordings that received heavy play. All Is Well. Sam Amidon (Bedroom Community). Recorded in Iceland's Greenhouse studios, with producer Valgeir Sigur?sson (Bonnie "Prince" Billy, CocoRosie), with musical wunderkind Nico Mulhy to orchestrate and compose string arrangements, Amidon delivers offbeat, sleepy renditions of early traditional American folk songs. The combination results in a simultaneously majestic and spare offering. All Is Well is one of the finest examples of the new wave of "Old Weird Americana." Un Día. Juana Molina (Domino). Unconventional instrumentation, multi-layered chants/vocals and often stridently original execution gives this release an otherworld-like quality. Produced, written and performed by this Argentine one-woman-band, Molina follows 2006's stellar Son with another recording of mesmerizing material. Trouble In Mind. Hayes Carll (Lost Highway). This Texas troubadour turns in a true honky tonk record, not heard with such conviction since, maybe, early Dwight Yoakum. A fine storyteller, Carll spins some good yarns, often with humor and irony. Songs such as "She Left Me For Jesus" and "I Got a Gig," earn him a stool at the road-weary bar of gifted Texas singer/songwriters that includes Guy Clark, Townes Van Zandt, Waylon Jennings and Willie Nelson. For Emma, Forever Ago. Bon Iver (Jagjaguwar). Bon Iver is the nom de plume for singer/songwriter Justin Vernon, who holed himself up in a remote cabin in northern Wisconsin for a winter after the end of both his band and a personal relationship. Vernon came up with a haunting set of songs that presents an excellent soundtrack to his mental (and literal) landscape. Intended as demos to be recut, friends urged him to release the recordings as is (aside from a few overdubs). And we're fortunate for that. For Emma, Forever Ago with its spare, ethereal and melancholic sound, is one of the most startling, and impressive, debut records to come out this year. Thing Of The Past. Vetiver (Gnomonsong). The Evangelist. Robert Forster (Yep Roc). Vol. 1: Frozen Ropes And Dying Quails. The Baseball Project (Yep Roc). Sea Lion. Ruby Suns (Sub Pop). Stay Positive. The Hold Steady (Vagrant Records). Fave Single: "42 West Avenue," Cashier No. 9. From Belfast, Northern Ireland, Cashier No. 9 is fronted by talented singer/songwriter Daniel Todd, who fills this catchy tune with plenty of quirky pop riffs. Hopefully, his band will receive a record deal and distribution stateside soon.